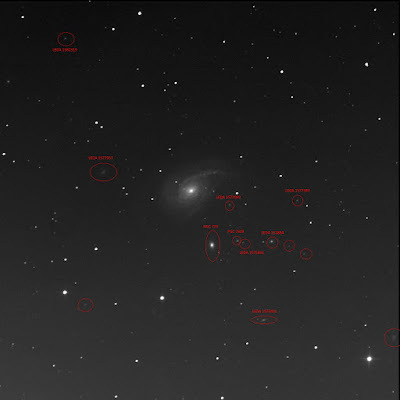 I asked the BGO robot to image NGC 772 for me (again). It tried (this time). It reported an error occurred. I only received luminance data. There's also a gradient in the image. An interesting spiral galaxy in Aries. One of the RASC Finest NGCs. It looks disturbed. It is also known as Arp 78. My first request of this object was rejected (back on 20 August). BGO said something to the effect that it was not possible at this time which made me think it was too low, so too early in this season. Clearly it did not protest this occasion. Still, I'll need to shoot it again, for the rest of the data. Again, there are a lot of other objects in this image! Over a half-dozen. LEDA 1577343. A small oval fuzzy west of NGC 772. LEDA 1577099. A small oval fuzz ball slightly south of due west. Close. LEDA 212884. A bright small oval lint ball west-south-west. LEDA 1575861. A very small oval just south-west of PCG 7509. PGC 7509. A medium bright round fuzzy south-west of the main galaxy. NGC 770. A very bright galaxy south-south-west of 772. Elliptical, it looks like. LEDA 1573401. A canted small spiral galaxy well beyond 770. LEDA 1577957. A very faint oval fuzz east of 772. LEDA 1582319. A small faint oval fuzzy to the north-east. Shot again on 11 September. Received all the data this time.